Madan. Devi disputes this story claiming that she has never stepped out of Calcutta, much less lived in Alirajpur at any point in her life. Over the next few days, Rahul, as a guest in Devi's house, continues to elaborate on his story in his attempt to convince her of its reality. He recalls anecdotes from their life together in Alirajpur, he alludes to the intimacy of their secret relationship, but fails to convince Devi. Rahul also meets Shila, Devi's sister-in-law and Madan's sister, and tells her stories of Alirajpur and Madan. However she is skeptical of her stories. One day, as Rahul is gradually becoming a part of Devi's and Shila's existence, he abruptly announces to Devi that he plans to leave. But Devi refuses to let him go, on the argument that his arrival is not of his own free will, but the outcome of her invoking a paramour. She now validates the truth of the Alirajpur stories and acknowledges the past relationship. However, now Rahul retracts from his earlier position, stating that the relationship was, in fact, fictitious. will rescue her from the mundanity of her existence and bring passion into her life. This yearning stems from both her emotional need to overcome loneliness and a suppressed sexual desire. 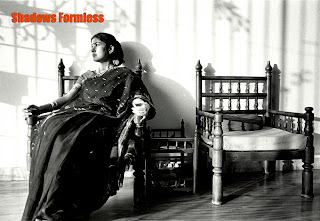 As the yearning translates into an imagined reality, the film travels through the daily life of this lonely woman, inhabited by a affectionate sister-in law and a paramour. alienation and loneliness, arising from nuclear family units and rising levels of marital separation and abandonment. In the absence of the support of the larger joint family, this alienation can take on the nature of a psychosis. The film attempts to probe into the complexities of such a state, which blurs the boundaries between reality and unreal. This film contemplates upon the reality of such an imagined world through the use of the aesthetic and structural possibilities of the cinematic medium.